In its fiduciary role, the independent school board has as one of its primary responsibilities the hiring, nurturing, and evaluating of the head of school. The evaluation is particularly important because, when done correctly, it provides good clarity between the head and board around the school’s strategic goals. It ensures that agreement is reached on the goals and objectives for a given year and that appropriate assessments of these goals are put in place. The board is responsible for the long-term sustainability of the school, which includes regularly undertaking strategic planning. As the keeper of the mission, the board adopts the strategic plan and expects that the plan be implemented under the leadership of the head of school. 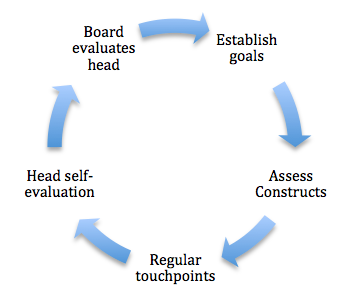 The head evaluation is a primary means by which the board assesses progress toward strategic goals. The head of school evaluation process should be structured to intentionally focus only on areas relevant to the board’s expectations of the head. Boards should resist using the evaluation process for individual trustees to voice complaints that are not pertinent to the work of the head. It is important to remember that the evaluation process is not a popularity contest. Often, well-liked individuals are ineffective as heads while less well-liked heads can at times be very effective. The board should assess the head on effectiveness as the CEO of the school since the board’s sole focus as fiduciary for the school is to do that which is best for the school. The evaluation of the head is solely the responsibility of the board and should never be relegated to stakeholders outside of the board. Confusion often exists when stakeholder groups (i.e. parents, students, faculty) are asked to rate the head’s performance. This tends to imply that individuals other than board members have an evaluative voice. For example when a faculty member is asked to provide input into the head evaluation process, the impression is given that his or her input is a de facto vote in the evaluation. This reality, however, should not be interpreted to mean that the attitudes of stakeholders are unimportant. In fact a school’s sustainability is dependent on positive attitudes from stakeholders. These attitudes should be assessed without implying to the stakeholders that their responses are part of the head evaluation. Stakeholder input exists for the assessment of given constructs that help the board understand whether or not goals are being met, not as direct input in the head evaluation. A construct is a conceptual understanding of a set of more complex ideas. It is an explanatory variable that is not directly observable such as intelligence or motivation. Several constructs are imbedded in virtually every school’s mission and therefore are important to assess to determine if the mission is being accomplished. Life-long-learner, civic responsibility, and academic excellence are examples of a few constructs regularly found in independent school missions. Furthermore, it is appropriate for the board to evaluate the head on various other constructs such as community relations and parent satisfaction if determined that they are important to mission fulfillment. However, the assessment of these constructs is a process that should remain separate from the head’s evaluation even when their results contribute to the head’s evaluation. For example, if the board agrees that faculty morale is important to fulfilling the school’s mission, this construct could be included as one of the criteria on which the head is evaluated. However, an assessment of faculty morale should be undertaken separately from the head’s evaluation process. Along with defined expectations, there are industry expectations that should influence the annual evaluation or in certain extreme cases provide cause for a mid-year evaluation. The head of school is expected to act legally and ethically. Additionally, the head is expected to know and adhere to policies established by the board, including areas such as budgetary, admissions, and financial aid policies. The annual head evaluation is the responsibility of the board only. It is appropriate to assess key constructs for which the head might be held responsible; however, these assessments should be undertaken with an understanding that no one outside of the board has a vote in the evaluation. Boards should take special care in identifying the goals, objectives, and constructs that should be used in the evaluation process. Upon defining these items, a plan to assess them in a reliable and valid manner is important. Clearly stated goals and areas of evaluation should be defined prior to the year for which the head will be evaluated. As much as possible the goals should be developed jointly by the board and the head; however, the head evaluation should be conducted on areas that have been defined in advance. It is expected that the head act in a legal and ethical manner. It also is expected that the head of school adhere to board policies regarding the administration of all school business. Once the constructs to be assessed are identified, it is important for the board to agree on an operational definition for each. This operational definition provides the basis for measuring the construct. For example, a construct of Parent Satisfaction could be defined as the degree to which current families would make the decision to enroll in your school if they had it to do over, feel proud to be members of the school community, and encourage other families to send their children to your school. Obviously, the assessment should be designed around the operational definition; therefore, if a commercial assessment is used, it will necessarily dictate the operational definition. Once the construct is described, there are a variety of methods to assess them. The school administration rather than the board itself will manage most of these assessments; however, there may be certain assessments that are more appropriately administered by the board. Focus groups are also a good way to assess certain constructs. To ensure the process is reliable, it is important that the facilitator be trained in focus group methodologies. Personal interviews of individuals from the target demographic can also be very effective. If interviews are conducted, it is important to create a safe environment for those interviewed to ensure the most honest responses. It is advisable to use one interviewer; however, if it is necessary to use multiple interviewers, a highly structured process should be implemented to create a high degree of inter-rater reliability. This addresses the degree to which each of the interviewers provides an identical or consistent experience for those interviewed. School data already exists on many levels. Data on academic achievement such as AP, SAT, ACT, or ERB scores currently exists. Development data includes dollar amounts generated by the Annual Fund or Capital Campaign. Qualitative assessment from individual trustees is, on some issues, the most appropriate measure. It is impossible to quantify every facet of the evaluation and there are areas in which trustees should be asked to make a judgment on the head’s performance. This should occur through a survey to board members, on which they are asked to make a judgment on the head’s performance in areas previously identified as a part of the evaluation process. Care should be taken to ensure that the judgments are made only on areas appropriate to the evaluation and that it does not provide a forum for trivial complaints or nit picking which is irrelevant to the head’s role. Review, as a board, the school’s mission and determine what expectations are appropriate to ensure that the mission is being implemented to the fullest degree. This could include things such as the admission of mission appropriate students, adherence to school policies, management of the board-approved budget. Review, as a board, the importance of other constructs on the sustainability of the school. This should be a comprehensive discussion that honestly recognizes how these constructs interact with a variety of other factors. For example, how faculty morale might be impacted by a board mandated reduction in faculty or reduction in budgets. In collaboration with the head of school, establish goals and objectives for the upcoming school year. These goals and objectives should be central to fulfilling the school’s mission and should be measurable, either by quantitative or qualitative methods. In collaboration with the head of school, decide what data should be collected, how it will be reported, and the process of assessing the goals and objectives. Use the data to inform the head evaluation as well as the strategic initiatives of the school. Prior to the start of the year: Establish jointly with the board and the head of school goals, objectives, and expectations for the year. Prior to the start of year: Identify additional constructs or areas to be evaluated. Throughout year: Commission an assessment of additional constructs identified to influence the board’s evaluation. Bi-monthly: Board chair and head discuss progress toward goals, objectives, and expectations at regular intervals throughout the school year. Late spring: Request of the head of school a self-evaluation related to goals for the year. Late spring: Request of the head proposed goals for the following year. End of school year: Convene board or evaluation committee to discuss the head’s self-evaluations and trustee evaluations. Prior to start of next year: Draft evaluation report for approval by the board. Prior to start of next year: Present evaluation report to head of school and establish goals for the following year. Following presentation of the evaluation to the head: Identify any areas in which the head would benefit from a specific professional development opportunity. Note: This sample evaluation timeline is intended to represent the type of yearly cycle that is important in the evaluation process, not to suggest that all schools should adhere strictly to this model. Additionally, most heads of school are on multi-year contracts and during times of contract negotiations the timeline could be altered to accommodate the negotiations.